The hunt for the ultimate, heavy-duty, grab-and-go, over the shoulder, cooler is over. Backed by a lifetime warranty, this RotoMolded cooler is Grand Canyon tough. 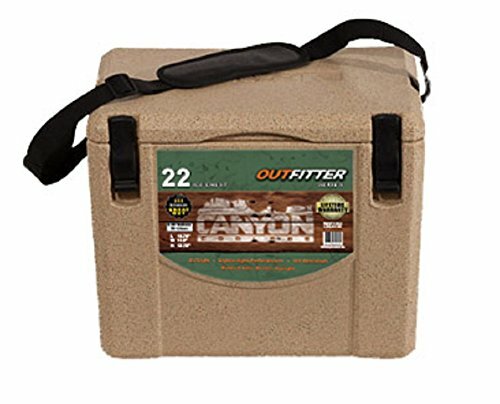 Sporting just the right balance of insulation, weight, and capacity, it has quickly become very popular with road warriors, fishing enthusiasts, blood banks or anyone needing a smaller, but equally tough, awesome ice chest. Built for a brutal world, The best personal cooler for Roughnecks, ATV's, Bait, Inflatable Kayaks, and angry Gorilla's. Ice Retention: 2-3 Days Perfect for day adventures away from base camp Fits great on a car seat or floor of vehicle Jobsite or construction lunch box Rated 40hr Blood/Plasma compatible with appropriate packing Features: Compare to YETI 100% recessed marine grade EZCAM latch Weight: 11 lbs. Integrated marine grade hinge Shoulder Strap: The Made in Montana shoulder strap is a soft, pliable, durable, polymer-based rubber. Resistant to sun fading, and flexible to 40 degrees below zero. The unique clenching action (wet or dry, warm or cold) of the strap won't slide off your shoulder and holds firmly to all fabrics. The 1" wide nylon webbing is molded directly into the 5/16" thick rubber shoulder pad. This makes the strap extremely strong and flexible. In fact, it's rated at a tensile strength of 868-980 lbs! Skid plates Capacity: 20 Liters/22 Quarts Ideal Can Capacity: 16 cans + Ice Max Can Capacity: 20 cans Beastly Insulation: Front Wall: 2" thick Back Wall: 1.44" thick Side Walls: 1.0" - 1.37" Lid: 1.0" to 1.375"
If you have any questions about this product by Canyon Coolers, contact us by completing and submitting the form below. If you are looking for a specif part number, please include it with your message.